phd.ouadmissions.com OU Ph.D Eligibility Test Results 2017, List of selected candidates for PhD Admissions. 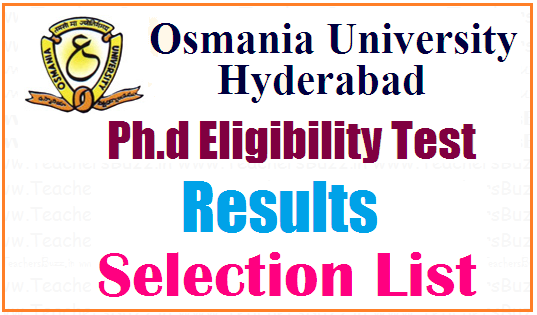 OU List of selected candidates for PhD osmania university 2017, phd notification 2016-17 in telangana, osmania university phd notification 2017, ou phd admission selected list download. Osmania University(OU ) Ph.D Eligibility Test Notification 2017 Online Applications, Hall Tickets Download @ ouadmissions.com , OU Ph.D Eligibility Test 2016/2017 Notification. Osmania University Ph.d Eligibility Test 2016 Notification has been issued by the OU, Hyderabad Officials on 30th December, 2016. OU Directorate of Admissions invites applications through online mode from the eligible candidates for Ph.D Eligibility Test 2017 in various subjects under different faculties of Osmania University. Ph.D. Eligibility Test is one of the eligibility criteria for admission into Ph.D. programmes offered by Osmania University in different subjects in the faculties of Arts, Social Sciences, Commerce, Management, Education, Law, Science, Oriental Languages, Engineering, Pharmacy, Technology and Informatics. Osmania University(OU ) Ph.D Eligibility Testonline application, list of subjects, syllabi of eligibility test, registration fee and other rules and regulations details are given here. Applications through online mode are invited for Ph.D. Eligibility Test in various subjects under different faculties of Osmania University. The candidates who have passed the Master’s degree in the concerned subject with a minimum of 55% marks (50% in the case of SC/ST candidates) are eligible to apply. For online application, list of subjects, syllabi of eligibility test, registration fee and other rules and regulations, the candidates are advised to visit the websites: www.osmania.ac.in and www.ouadmissions.com. The Degree of Doctor of Philosophy (Ph.D) shall be conferred by Osmania University in the Faculties of Arts, Commerce, Management, Education, Law, Social Sciences, Oriental Languages, Science, Technology, Pharmacy, Engineering, Informatics and in such other faculties as may be notified in future, in accordance with the provisions of these rules and regulations in current or amended form, and subject to the conditions laid down herein. In all the Faculties a candidate is eligible for registration/admission into PhD course in a subject, if he/she has obtained a Post-Graduate Degree, from a recognized University or a Post Graduate Degree through Distance mode from a recognized University and approved by the Distance Education Council (DEC), New Delhi, in the concerned subject or in an allied subject approved by the Osmania University securing not less than 55% marks at the Post-Graduate Degree and securing not less than 50% marks in the case of SC/ST candidates. Note: The candidates have to appear in the Ph.D. Eligibility Test in the subject in which they wish to pursue Ph.D. (For eg. a candidate with M.Com. qualification may pursue Ph.D. in Business Management provided he/she appears and qualifies in the Ph.D. Eligibility Test in the subject of Business Management).